If you are in a sports league or take part in a weekly activity, it is important to understand how pregnancy will impact your routine. There are a lot of variables and little things to know. Many professional athletic organizations around the world have addressed the concern for increased health risks during pregnancy. Chances are if you’re an experienced athlete, playing in the first trimester of your pregnancy is probably safe depending on the sport. However, your pregnancy isn’t the time to take up a new sport of any kind. In many cases, you might have to put your sports aside for a while, while other activities may be perfectly safe for you and your growing baby. If you are pregnant, it is a good idea to get regular exercise. Doing so will allow you to control your weight gain, help to maintain a positive image of your body, lower the risk of diabetes, decrease or eliminate lower back pain and it can even help speed up the amount of time you will be in labor. The trick is in knowing what exercises are safe and what needs to be avoided, especially when you are in the second and third trimesters. In general, you want to avoid any high-impact activities where there is a chance you will fall or collide with someone else. Many sports and activities that require quick jarring motions, twists and sudden impacts can create vibrating motions within the uterus and may lead to a premature separation of the placenta from the wall of the uterus, called placental abruption. If you are unsure whether or not a certain sport or activity is safe, always check with your OB first. Keep in mind that you want to avoid doing anything that might put you at risk for falling or losing your balance. As your bump grows, your center of gravity will change and it can become a little disorienting. Things that were easy before will become deceptively tricky. After a couple months, you might get “pregnancy brain.” You could have trouble keeping track of the score of a game or even losing track of which team you are on at times. This list is going to feel prohibitive and in some cases, your doctors will give you permission to do some of them. Make sure that you are fully informed before undertaking any type of strenuous activity. 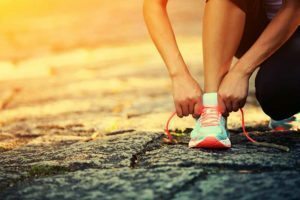 Depending on your level of athleticism, you may want to restrict your sports and activities that contain lots of jarring motions or sudden impacts. Horseback riding – For the experienced equestrian, in the early stages of pregnancy, if the horse is only walking while you’re on its back, the danger to your baby is low. As your pregnancy increases, however, the risk factors increase as your baby moves higher up in the abdomen, giving it less protection from harm should you fall. In addition, the quick jolting motions of riding can increase the risk of placental abruption. Water slides and amusement park rides – The concern with roller coasters, water slides and the like during pregnancy is due to the rapid starts and stops, the jarring forces and the pressures against the body that occur during these types of rides. 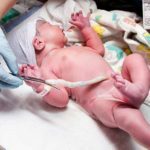 This jarring activity can lead to placental abruption. Running – Depending on your previous experience with running can determine how much you can tolerate during your pregnancy. Trained runners can often run during pregnancy with no issue, it all comes down to staying careful and not overdoing it. When it comes to your balance, be aware of activities that rely on stability and steady equilibrium as your shifting center of gravity can increase your risk of falling. Any type of skiing or snowboarding – Due to the high risk of falling, these wintertime activities should be put on hold until the completion of your pregnancy. comfortability with your center of gravity and if you notice your arms moving out to help you catch your balance, hang up your skates and prop up your skateboard for the time being to avoid falling and causing harm to yourself or your baby. Gymnastics – The increased risk of falling and required twists and pulls on the abdomen may increase the risk of placental abruption. 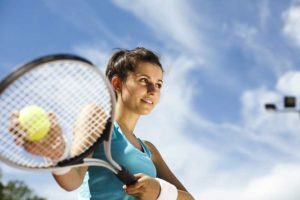 Tennis – As your center of gravity shifts during your pregnancy, the rapid changes in direction and sudden twists and turns of the torso that are required in tennis may become a risk factor for falls, contractions or placental abruption. If you normally play singles, try switching to doubles for the first stage of your pregnancy to give your body a little break on the court. Then resume your game after you have recovered from your pregnancy and can safely return to the court. Cycling – When it comes to bike riding, precautions must be taken. Mountain or trail riding risks are too high for pregnancy due to the higher risk of falls. However, riding your bike on a road is acceptable, but only during your first trimester. Even then, most doctors will recommend that you use an exercise bike instead. High and low-altitude sports such as hot-air ballooning, scuba diving and mountaineering should also be avoided as the change in oxygen levels and increase in pressure can put you and your baby at risk for altitude sickness. Scuba diving – This is one activity you’ll want to sit out on during your pregnancy as it isn’t safe when you are pregnant because you might get decompression sickness. Diving is also known to increase the chances of a miscarriage or birth defects. As you surface, bubbles of nitrogen sometimes enter the bloodstream of your baby. Air ballooning – This may seem harmless, but the reason to avoid it is similar to scuba diving. It is not the activity that is cause for concern but rather the change in pressure. When you hit a higher altitude, there is less oxygen and you or your child can get altitude sickness. Contact or collision sports should be avoided at all times during a pregnancy. These include football, rugby and hockey. Volleyball – Activities such as volleyball that carry a risk of collisions, dives and contact should be avoided. If you were an experienced volleyball player prior to your pregnancy, you may get the green light to continue during the initial stages of your pregnancy. However, diving for the ball should be one thing you avoid doing. Baseball and softball – Due to the number of risks associated with the sport, baseball and softball can raise concern for the health of the mother and baby. While there is always a chance of a batted or thrown ball hitting the abdomen and causing damage, the higher concern rests with a loss of balance while running bases and any potential sliding or diving. If your level of play includes a simple get together of your friends or family once a week to play ball, taking it easy and avoiding abdominal impacts may be relatively easy. However, if you find yourself diving for balls and sliding into bases, then it’s best to play it safe and watch from the dugout until your pregnancy is complete. Boxing, kickboxing, martial arts – Typically, any type of boxing or martial arts is a contact sport and the risk of impact may be dangerous for pregnant women. However, the aerobic versions of boxing can be safe to continue if your doctor gives you the OK. As your pregnancy progresses you’ll need to lower your kicks and shorten your punches to protect your joints and keep your balance. If you notice that your center of gravity causes movements to cause you to misstep, play it safe and take a break from the bags until after your baby is born. When partaking in any sport or activity, you need to be aware of the risks of overheating. High temperatures are known to cause birth defects. You need to drink a lot of water and don’t partake in any sports in hot or humid conditions. While some sports may be deemed safe during pregnancy, many women may encounter back pain, especially during the fifth and seventh month, due to the increased lumbar lordosis and ligamentous laxity of the symphysis and sacroiliac joints. It is a good idea to listen to your body and follow your instincts. Even if you are doing something that you are told is safe, you should stop if it feels wrong. Always err on the side of caution. After you hit 18 weeks, you should not do any activity that involves you lying on your back with legs raised such as sit-ups. The weight of the womb can put pressure on your vena cava and you will feel light-headed and dizzy. Yoga – This activity is great and specific types of yoga can be altered for various athletic abilities and stages of pregnancy. Golf – This low-impact sport can be a slower paced game and allow for a lot of low-impact walking. In fact, Catriona Matthew of the LPGA actually won the Brazil Cup when she was five months pregnant. Just make sure if you are about to head out to the green that it’s not too hot out. Walking – This activity is highly recommended. While not necessarily a sport, it is thought that 30 minutes of walking each day is a good goal to help stay in shape during your pregnancy. Just remember to decrease your pace if you begin to feel tired. Swimming – Our bodies feel extremely light when we’re submerged, which is why swimming is particularly relaxing for pregnant women. The water temperature should ideally be between 18 and 25 degrees Celsius—in general, you should feel comfortable when entering the water. Just be sure to not hold your breath, as it can affect the amount of oxygen in your blood. Consistency is key. It is not good to have an intense workout and then go through a long period of being sedentary. If you can, keep a routine and rhythm to your exercise schedule, listen to your body and most importantly listen to your doctor’s words of advice when it comes to physical activity restrictions. Regardless of your sport, when you play a sport during your pregnancy, it is important to always warm up and cool down before and afterward. Avoid extreme temperatures and overheating. Stay hydrated and cool. And be sure to always listen to your body, talk to your doctor, and weigh all the possible risks before you make a decision to participate or sit out.